Dirt Jumping evolved alongside bmx racing from its birth. 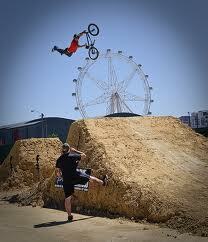 Dirt Jumping is similar to BMX or Mountain bike racing in that the rider jumps off of mounds of dirt. It differs in that the jumps are usually much larger and designed to lift the rider higher into the air. Additionally, the goal is not to complete the course with the fastest time, but rather to perform the best tricks with the best style. Trails are most often hand built, with attention to detail. Dirt jumping competitions have grown with it being part of the x-games and the Dew Tour. Double: the most common form of Dirt jumps. This consists of two separate earthworks, one acting as a takeoff(lip), and the other as a landing. Also known as a “gap” jump. They can be “Step-Ups”, where the jump’s upramp is lower than the down ramp and the rider loses speed, or “Step-Downs”, where the jump’s downramp is lower than the upramp, meaning that they gain speed. Tabletops: are more common among those new to the sport, they are a single earthwork with a takeoff at one end, and a landing at the other, with a flat ‘table’ on the top. These are favored by new riders because when the rider comes up short they can still easily ride out of it. Ski Jumps: consist of just a takeoff, they’re usually longer and flatter than other jumps, and tend to be situated on downhills, so the slope of the hill can serve as a landing. They’re used mostly in competitions on jump length. Rollers: are small tabletops that give you extra speed by ‘pumping’ the jump. You usually would find these at the beginning of a trail. Step ups: are ramps just before inclines to enable rider to jump from the top of the incline. Whoops/Rhythms: a series of three or more small rounded ramps close together to enable rider to ‘manual’ over them. Spine: is one earth work with a take-off and a landing, but no table or gap, made to get higher air without distance. Berm: basically is a curved wallride that comes out of the ground. Mostly used on sharp turns in which helps you by giving you the ability to ride on your side. The curve allows you to make a sharper turn. Mainly used on downhill trails but, also used dirt jumping to avoid hitting trees. They are also used to maintain your speed without having to brake on turns. Some trails consist of jumps that lead into berms. Hip Jumps: consist of the landing being anywhere within 0 – 90 degrees, left or right of the take off enabling you to transfer. Most of these jumps are the same types of jumps that you would find on a BMX race track and when trail riding. Tabletop While in the air tipping the bike on its side to a 90° angle or further. Euro Table sometimes called a Dark side, a euro table is when you turn your handlebars downwards instead of upwards as you would in a table. Invert essentially a table, but over extended. possibly enough for the front tire or fork to rub on your shoulder. Unturndown Similar to an Invert, but the riders legs remain straight and the seat tend to wrap around the riders outside leg. Whip Keeping the front of your bike straight while flicking the back to one side. There are many different styles of whips, each depending on the style of the rider. Tuck No Hander Both hands off the handlebars with your legs pinching top tube and your bars in your lap. Suicide No hander hands behind back while in the air with legs pinching seat. Toboggan One hand off handlebars touching the seat or top tube, one hand turning bars 90°. Tilt front down for extra style. No footer Both feet off pedals. Nac-Nac Similar to the One foot can, except your leg goes behind your other one still on the pedal, instead of in front. Backflip Rotating bike and rider completely upside down & continuing to rotate 360° of vertical rotation until facing original angle/direction. Can also be performed twice (while still in the air) to make a double back flip. 360 Rotating the bike and rider completely round 360° horizontally until facing original direction. Turndown Similar to an x-up but the entire body turns with the bars and the bike frame is as vertical as possible. Variation on the “cross-up” which incorporates elements of both the “Table” and X-up. Superman No footer with feet extended out to the back, in a Superman position. Nothing Nothing is touching the bike, neither arms nor legs, hence the name. 3-Star Only one hand touches the handlebars, so the extended arm and legs form a star. Backflip Tailwhip (Flipwhip) As the name suggests, doing a tailwhip whilst upside down (halfway through) a backflip. Flair More commonly a bmx trick, this can be also be done on a mountain bike. It involves getting substantial air off a vert ramp, then doing a backflip and 180 so that you roll down the ramp going back the way you came. Truck Driver Combination of a 360 and a Barspin. Decade Like a barspin, but person wraps around with the bars in a 360° position while tail stays straight. Dumped 360 Like a regular 360, but the rider dips the front of the bike down so that both the rider and the bike are vertical during the rotation, the end of the rotation generally feels and looks a bit like a backflip. California Roll Invented by Mike Montgomery, this is where the rider does a 360 around his bike, it is similar to a body varial however the rider does not touch the bike during the rotation.